Provide comfort for the family of Thomas Betty with a meaningful gesture of sympathy. 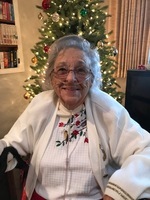 Betty Ann Thomas, age 92 of Hastings, passed away peacefully on March 24, 2019 at Spectrum Butterworth Hospital. In accordance with Betty’s wishes cremation has taken place and no services are planned at this time. Please visit www.beelergoresfuneral.com to share a memory or to leave a condolence message for Betty’s family. To send flowers in memory of Thomas Betty, please visit our Heartfelt Sympathies Store. Provide comfort for the family of Thomas Betty by sending flowers. May the family of Thomas Betty please accept my sincere condolences hoping you find comfort in God's words at Acts 24 : 15 and Psalm 37 : 29.